Although I don't want to give away too much of the book Writing Your Journal Article in 12 Weeks on this blog, I will say that by the beginning of the second "week" (really a five-day period that you can schedule during the work week or run consecutively, as you wish) I'm starting to get a bigger-picture sense of her logic, and this book really does work. It will clear out the cobwebs whether you are on your first article, or your fifth. 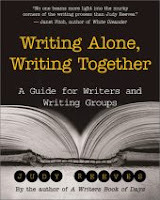 I love this book and I can envision publishing many articles with its sensible help as a guide. Today's exercise requires a partner, so I'm going to wait until the articles group meets tomorrow morning and then ask them all for input. It's great that Belcher includes partner exercises, because it forces you (against all instincts, sometimes) to socialize your work before writing too much of it. By getting authors to achieve certain points of clarity early, Belcher gets to the heart of various complaints that journal editors have about articles that are fuzzy or of uncertain value. One note about discussing work with an academic partner. I feel shy about it! Even though I run groups at Booklab, for some reason I really want to hide my work right now, but Belcher advises the opposite. This feels scary, vulnerable, weird, you name it.